"My Gym Partner's a Monkey"
My Gym Partner's a Monkey is an American animated television series created by Tim Cahill and Julie McNally Cahill that originally aired on Cartoon Network from December 26, 2005 to November 27, 2008. The series follows Adam Lyon, a human who, after a clerical error listed his surname as "Lion," is forced to transfer to Charles Darwin Middle School, a school for local anthropomorphic zoo animals, where he is partnered with Jake Spidermonkey in gym, and quickly becomes best friends with him. Two DVD volumes have been released in 2007 and 2008 in Australia. My Gym Partner's a Monkey was a ratings success for Cartoon Network, gaining millions of viewers. The series was met with generally positive reviews from critics. It was nominated for four Annie Awards and won an Emmy Award. Adam Lyon is transferred to a middle school established for anthropomorphic zoo animals due to a spelling error making his surname "Lion". There, he is befriended by a mischievous, eccentric spider monkey named Jake, hence the title of the series, along with a sassy Toucan named Lupe, a giraffe named Ingrid, who is infatuated with Adam, the intelligent, wise gorilla Windsor, and Slips the easygoing python. In spite of his usual kindness and fondness for his friends, Adam despises being banished to Charles Darwin Middle School because of something beyond his control and longs for his previous human middle school. Usually, the episodes are focused on Adam's experiences at Charles Darwin Middle School due to his inability to fit in with his anthropomorphic schoolmates, the challenges that he must face (such as the presumed stupidity of his peers, being schooled in subjects of use only to animals, the introductions of new students of odd, dangerous, or fictional species to the school or the misadventures that Adam stumbles into with them, or the common effects of adolescence as they are experienced by zoo animals). The series began its regular run with a three-episode premiere on Cartoon Network's "Fridays" block on February 24, 2006. The My Gym Partner's a Monkey-based television film The Big Field Trip aired on January 14, 2007, as part of season 3. A special episode, "That Darn Platypus", aired on Cartoon Network on May 18, 2007, as part of Cartoon Network Invaded, a mini-series that aired 5 specials of different series from May 4 to May 28, 2007. The series ended its 4 season-run on November 27, 2008, with the episode "A Thanksgiving Carol". Reruns of the series are shown on the revived block Cartoon Planet since April 27, 2012. In Latin America the series currently airs on Tooncast since 2013. In Ukraine, the series aired on Novyi Kanal. The show runs in India on channel Cartoon Network by the name "Samsher Sikander Chuddie Buddie". Two DVD volumes of the series have been released in region four. The first volume, King of the Jungle (featuring twelve episodes, a total of 150 minutes), was released on April 4, 2007, and the second volume, Monkey Business (featuring thirteen episodes, a total of 154 minutes), on January 23, 2008. There have been no further volumes released. This compilation features "Bubble or Nothing" (12a). Contained the first group of twelve episodes from the first season. Contained the second and final group of thirteen episodes from the first season. My Gym Partner's a Monkey was a ratings success for Cartoon Network. On the series' Cartoon Network "Fridays" block two-episode premiere at 9:00 and 9:30 P.M. EST, the first episode was seen by 1.2 million and the second by 1.3 million children ages 2–11, according to preliminary data from Nielsen Media Research. The 9:30 P.M. telecast ranked as the #1 telecast on all television, broadcast and cable, with both boys 6–11 and boys 2–11 in the time period. The series went on top the Fridays block ratings, gaining millions of viewers. My Gym Partner's a Monkey received generally positive reviews from critics. William Barker of Web Wombat gave the King of the Jungle DVD a positive review, awarding it with a score of 70%, saying: "With an original – dare I say unique? – premise, My Gym Partner's a Monkey makes for a somewhat refreshing change from super heroes and mutants, and the cut-out animation style is captivating, though far from novel. It's not the most impressive cartoon show I've ever seen, but it's quite cute and fairly amusing – even for the older primates among us." Larisa Wiseman of Common Sense Media awarded the series three out of five stars, saying: "It's difficult to tell what age group the show's producers were aiming at – the animation style and slapstick by themselves would seem to appeal mainly to grade-schoolers, while the jokes and life lessons are definitely aimed at the tween set. The sly humor may even give some adults the occasional laugh-out-loud moment. Overall, My Gym Partner's a Monkey is commendable for its effort to include a subtle message in each episode. Younger viewers will probably find Jake's sometimes-annoying goofiness amusing, and will definitely find the story lines entertaining." ^ a b Baisley, Sarah (January 12, 2007). "My Gym Partner's a Monkey First Feature Movie Airs Jan. 14". Animation World Network. Retrieved July 1, 2012. ^ "Cartoon Network Brings Back 'Powerpuff Girls,' 'Dexter's Laboratory' And More With 'Cartoon Planet' (VIDEO)". The Huffington Post. AOL. March 29, 2012. Retrieved May 5, 2012. ^ "TV Serial & New Episodes On – Latest News, Photos & Videos". The Times of India. Retrieved 28 September 2017. ^ "My Gym Partner's a Monkey – King of the Jungle (Volume 01)". Madman Entertainment. Funtastic Ltd. Retrieved July 1, 2012. 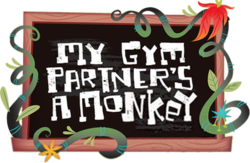 ^ "My Gym Partner's a Monkey – Monkey Business (Volume 02)". Madman Entertainment. Funtastic Ltd. Retrieved July 1, 2012. ^ Barker, William. "My Gym Partner's a Monkey". Web Wombat. Retrieved June 8, 2012. ^ Wiseman, Larisa. "My Gym Partner's a Monkey". Common Sense Media. Retrieved June 8, 2012. ^ a b "Legacy: 34th Annual Annie Award Nominees and Winners (2006)". Annie Awards. Archived from the original on May 9, 2008. Retrieved June 8, 2012. ^ "Academy of Television Arts & Sciences Announces Emmy® Award Winners in Costumes for a Variety or Music Program and Individual Achievement in Animation". Emmy Awards. August 21, 2007. Archived from the original on September 7, 2010. Retrieved June 8, 2012. ^ a b "Legacy: 35th Annual Annie Award Nominees and Winners (2007)". Annie Awards. Archived from the original on March 13, 2012. Retrieved June 8, 2012.